This unfortunate young man spent a very cold night on the streets of New York City in February. His rectal temperature on arrival in the ED was 84°F (28.8C). 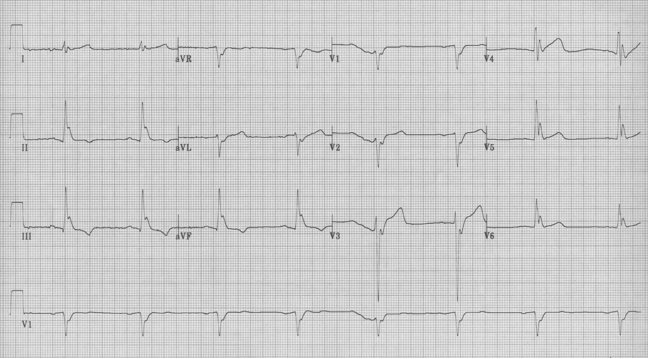 This EKG is a beautiful example of some of the changes of hypothermia. As core temperature falls below 32°C (90° F), sinus bradycardia develops, associated with progressive prolongation of the PR interval, QRS complex, and QT interval. As temperature approaches 30°C (86° F), atrial fibrillation commonly develops. By 30°C, Osborn waves (or J waves) develop in 80% of patients. These additional terminal deflections of the QRS complex are most prominent in the leads with the greatest voltage, and they tend to follow the axis of the QRS complexes. They become more prominent as body temperature drops, and regress gradually with rewarming. 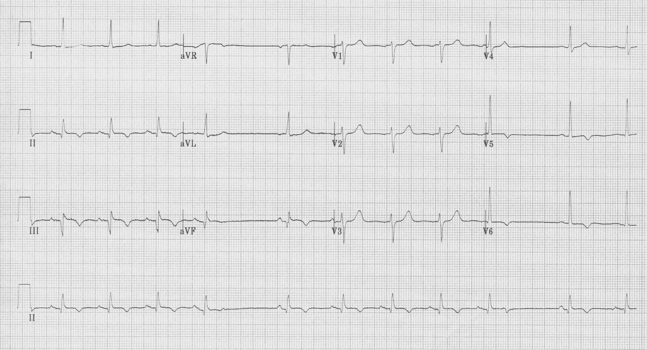 This patient has a slightly irregular rhythm which corresponds to her sensation of “a skipped beat”. The rhythm is essentially sinus at 75/minute with occasional pauses in the regular rhythm. The pauses are caused by an early atrial depolarization (a PAC) which does not conduct because it occurs so early that the conducting system is still refractory to further beats (a blocked PAC). This is evident in the rhythm strip as a deformed T wave of the complex preceding the pause (P wave within the usual T wave). “The most common cause of a pause during sinus rhythm is a blocked PAC”. 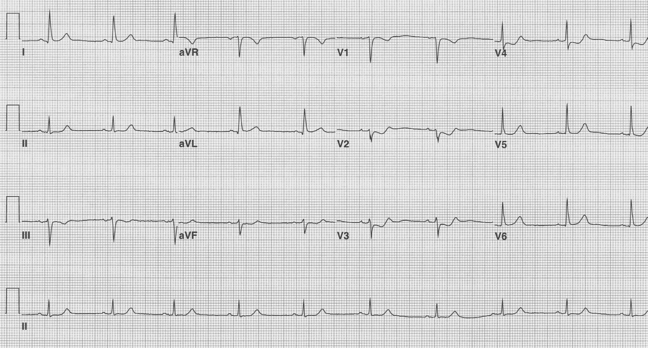 45-year-old male with 1 hour of chest pain radiating to the back. In a patient with a concerning history of chest pain, the most striking part of this EKG is the ST-segment depression in V2-3—the EKG depiction of an acute isolated posterior MI. Posterior wall MI usually accompanies an inferior MI, identified as ST-segment depression in V2-4 (often referred to as “reciprocal” changes). Rarely, in maybe 3-5% of all acute MIs, an occlusion of the circumflex artery may cause identifiable infarction in only the posterior wall. Remember, the posterior wall of the heart has no direct EKG representation—we see “reverse” changes in the EKG as the anterior leads (V2-4) reveal the posterior wall changes. Instead of the ST-elevation of an acute transmural MI of the anterior surface of the heart, these leads will depict ST-segment depression with a posterior wall infarct. Imagine picking the EKG up from the bottom and flipping it over—these same leads now reveal typical ST-segment elevation (a visual aid to help you believe!). This presentation is important to recognize because it is an appropriate opportunity for acute intervention. These patients should be referred to interventional cardiology for catheterization and angioplasty. If interventional cath is unavailable, thrombolytics should be considered. Life in the Fast Lane has a particularly good page on this topic.